John Baldessari is often endearingly referred to as “the guy that puts dots over people’s faces.” He is considered the godfather of conceptualism, having made a career out of defying expectations. Over 50 years, his inquisitive approach to making art has expanded the parameters of what we consider to be “art.” His work certainly succeeds in making people stop, look and reflect rather than simply taking it in passively. His sharp insights into the nature of perception and relationships between images are engaging, highlighted by his trademark deadpan humor. Baldessari pledged, in a 1970 groundbreaking work “I will not make anymore boring art.” This pledge was addressed to both his viewers but also to himself. He has remained true to his word, never shying away from new media, allowing his works to always retain a freshness and relevance that many younger artists struggle to match. Through his experimentations, he became responsible for the way many artists use appropriation in their work today. Kruger, Sherman and Salle are among the many that cite him as an influence. He is a giant of contemporary art. This week’s Work of the Week! WOW! is named Money with Space Between. Baldessari has spent his entire life living and working in California. It is therefore not surprising that much of his works incorporate Hollywood film stills and other cinematic imagery. The artist never addresses the source of his images, considering the copy itself the true source. 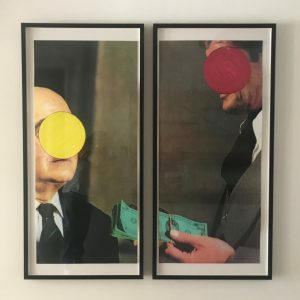 Money with Space Between has all the visual and narrative qualities of a film still – an action is taking place between two men dressed in suits, their faces obscured by Baldessari’s famous dots. Baldessari came upon colored stickers on produce at grocery stores and found the simple method of demarkation and concealment fascinating. The dots hide from view areas of interest and force the viewer to refocus their attention on other elements. In placing dots over the faces of the two men in Money with Space Between, the action that taking place – an exchange of money – becomes the focal point. Through eliminating all additional information, such as the expressions on the protagonist’s faces, Baldessari gives the viewer the freedom to interpret the situation and make their own assumptions. Despite that the dots can be challenging or startling to the viewer, this is not a work that requires deep reflection. It is simple and straightforward. The title says it all: money with space between. What is complex about this work is the presentation. There are specific instructions on how to frame the piece, provided by artist. Both panels are framed separately. The top and bottom margins are 2 1/2 inches wide, the left margin on panel A (the left panel), is 1 1/2 inches wide, and the right margin 1/2 an inch wide. Conversely, panel B is a mirror opposite, the left margin being 1/2 inches and the right margin 1 1/2 inches. The frame itself is specified to be a black matte finish, with the face measuring 3/4 in, and 2 inches deep. The space between the two sheets (not the frames) is to measure 4 1/2 inches. When looking at the work as a whole, the specifications of the framework create an illusion of it being one whole piece, as opposed to two separate panels. In a 2013 interview with David Salle, Baldessari said: “I go back and forth between wanting to be abundantly simple and maddeningly complex. I always compare what I do to the work of a mystery writer—like, you don’t want to know the end of the book right away. What a good writer does is give you false clues. You go here, no, that’s not right; you go here, no, that’s not right, and then … I much prefer that kind of game. 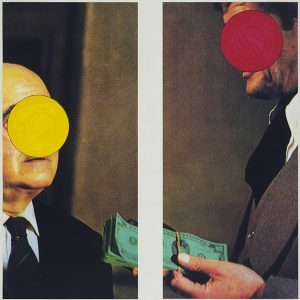 But then you get tired of yourself and you just want to be forthright.” In Money with Space Between Baldessari manages to capture both simplicity and complexity in a manner that is truly unique to him. This entry was posted in WOW! and tagged americanart, art, artgallery, baldessari, contemporaryart, dots, fineart, greggshienbaum, greggshienbaumfineart, gsfineart, gsfineartmiami, johnbaldessari, miami, modernart, money, MoneyWithSpaceBetween, workoftheweek, WOW, WOW!, wynwood, wynwoodmiami by admin. Bookmark the permalink.